Daniel Strong was born on 18 November 1784. He was the son of Ebenezer Strong and Lucy Kilbourne. [S755] Sarah Brennan, "Marshall Maynard Holcombe," e-mail to James H. Holcombe, 12 August 2012. Jane M. Overton was the daughter of F. W. Overton and Fannie H. Jeffers. Florence Moore Jeffers was the daughter of James Rufus Jeffers and Clausia Noble Moore. Herbert Kingsbury Jeffers was the son of James Rufus Jeffers and Clausia Noble Moore. Herbert served two years as a Sgt. in the First World War in France and was one of twenty five volunteers to provision the "Lost Batallion." [S25] Hannah McPherson, Holcombe Genealogy, Page 117.1/Item A-8-1-1-13-1-3-9-2-2. Ebenezer is recorded in the 1870 census of Rock Creek, Morgan Twp., Ashtabula Co., OH, as a retired minister owning $5,000 real estate, wife Laura. Ebenezer Latimer was born circa 1799 at Otis, Berkshire Co., MA. He was the son of William Latimer and Lucinda Holcombe. [S25] Hannah McPherson, Holcombe Genealogy, Page 117.1/Item A-8-1-1-13-2-1. William Latimer was born in 1800 at Otis, Berkshire Co., MA. He was the son of William Latimer and Lucinda Holcombe. William is recorded in the 1850 and 1870 censuses of Morgan Twp. Ashtabula Co., OH, as a farmer. [S25] Hannah McPherson, Holcombe Genealogy, Page 117.1/Item A-8-1-1-13-2-2. Daughter Latimer was the daughter of William Latimer and Lucinda Holcombe. Hiram is recorded as a farmer in teh 1850 and 1870 censuses of Morgan Township, Ashtabula Co., OH. In 1870 his daughter Sabra Emeline was his housekeeper. Hiram Latimer was born on 18 July 1804 at Otis, Berkshire Co., MA. He was the son of William Latimer and Lucinda Holcombe. Hiram Latimer married Huldah Holman, daughter of Thomas Holman and Huldah (? ), in March 1829 at Lennox, Ashtabula Co., OH. Hiram Latimer died on 2 December 1886 at Rock Creek, Ashtabula Co., OH, at age 82. [S25] Hannah McPherson, Holcombe Genealogy, Page 117.2/Item A-8-1-1-13-2-4. [S25] Hannah McPherson, Holcombe Genealogy, Page 117.2/Item A-8-1-1-13-2-6. McPherson indicates there were 7 children born to Austin and Evelina. Austin Latimer was born circa 1811 at Otis, Berkshire Co., MA. He was the son of William Latimer and Lucinda Holcombe. Austin Latimer married Evelina Church. [S25] Hannah McPherson, Holcombe Genealogy, Page 117.2/Item A-8-1-1-13-2-7. Collns is recorded in the 1850 census of Morgan Township, Ashtabula Co., OH, with his family as a farmer. Collin Latimer was born circa 1814 at Otis, Berkshire Co., MA. He was the son of William Latimer and Lucinda Holcombe. Collin Latimer married Mary Dikeman. [S25] Hannah McPherson, Holcombe Genealogy, Page 118.1/Item A-8-1-1-13-2-8. [S25] Hannah McPherson, Holcombe Genealogy, Page 118.1/Item A-8-1-1-13-2-9. Melvin Porter Case was born on 12 April 1852. He was the son of Hector Case and Caroline Bingham Osborn. Melvin Porter Case died on 29 July 1861 at age 9. He was buried at Copper Hill Cemetery, East Granby, Hartford Co., CT.
Rhoda Moses was born circa 1743. She married Andrew Case, son of Josiah Case and Mary Hoskins. Rhoda Moses died circa 1840 at Barkhamsted, Litchfield Co., CT.
Andrew Case Jr. was born on 25 October 1777 at Barkhamsted, Litchfield Co., CT. He was the son of Andrew Case and Rhoda Moses. Andrew Case Jr. married Almira Rose, daughter of Daniel Rose and Sarah Parker, on 29 April 1807 at Barkhamsted Congregational Churc, Barkhamsted, Litchfield Co., CT. Andrew Case Jr. died on 16 April 1865 at Granby, Hartford Co., CT, at age 87. [S101] Ruth Cost Duncan, John Case, Page 88/Item 200. [S161] Carol A. Laun, Granby Center Cemetery, Page 73. Almira Rose was born on 1 January 1785 at Granville, Hampden Co., MA. She was the daughter of Daniel Rose and Sarah Parker. 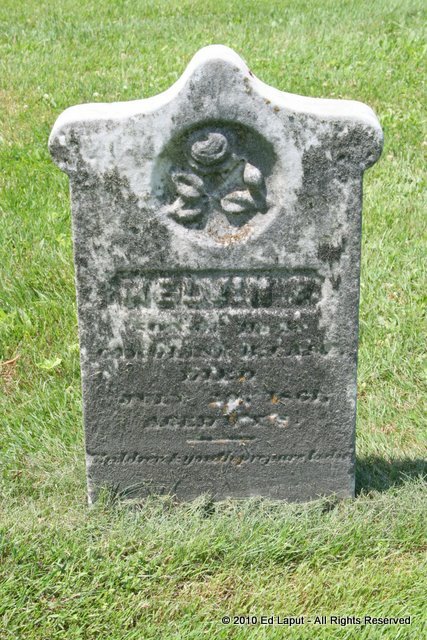 Almira Rose married Andrew Case Jr., son of Andrew Case and Rhoda Moses, on 29 April 1807 at Barkhamsted Congregational Churc, Barkhamsted, Litchfield Co., CT. Almira Rose died on 6 February 1879 at Granby, Hartford Co., CT, at age 94. Children of Almira Rose and Andrew Case Jr.
Denison Case was born on 2 April 1812 at Barkhamsted, Litchfield Co., CT. He was the son of Andrew Case Jr. and Almira Rose. Denison Case married Sarah Ardelia Searle, daughter of David P. Searle and Lydia Allen, on 10 May 1837. Denison Case died on 9 January 1896 at Granby, Hartford Co., CT, at age 83. Denison and Sarah were enumerated in the 1860 Granby, Hartford Co., CT, census. Sons Oscar and Albertus, and parents Andrew and Almira were also in the household. Denison and Sarah were enumerated in the 1870 Granby, Hartford Co., CT, census. His mother, Almira was also in the household. In addition an Emma Smith, age 8, and a boy, age 5 that appears to be their grandson, Burt F.
[S101] Ruth Cost Duncan, John Case, Page 134/Item 370. Sarah was recorded in the 1900 Granby census, page 6A, line 34. Her sister Charlotte was living with her. Son Oscar was living next door. Sarah Ardelia Searle was born on 24 October 1819. She was the daughter of David P. Searle and Lydia Allen. Sarah Ardelia Searle married Denison Case, son of Andrew Case Jr. and Almira Rose, on 10 May 1837. Sarah Ardelia Searle died on 26 March 1905 at Granby, Hartford Co., CT, at age 85. Abner Jonathan Ewing was born on 5 February 1855 at Wayne Co., IA.1 He was the son of Andrew Ewing and Taphena Holcombe. Abner Jonathan Ewing married Mary Elizabeth Armon. [S356] Nancy Hanks Ewing compiled by Barbara Ewing Powell James Ewing, Book 2, Volume 3. Charlotte C. Searle was the daughter of David P. Searle and Lydia Allen. Charlotte was recorded in the 1900 Granby census, living with her sister, Sarah Case. [S101] Ruth Cost Duncan, John Case, Page 168/Item 503. Frances Linclon was born on 23 September 1844 at MA. She was the daughter of Francis Lincoln and Rebecca (?) Frances Linclon married Oscar Denison Case, son of Denison Case and Sarah Ardelia Searle, on 22 July 1863 at MA. Frances Linclon died on 15 April 1865 at Granby, Hartford Co., CT, at age 20. Bert Francis Case was born circa 1865 at CT.1 He was the son of Oscar Denison Case and Frances Linclon. [S101] Ruth Cost Duncan, John Case, Page 139/Item 388. [S161] Carol A. Laun, Granby Center Cemetery, Page 49. Lizzie May Hollister was born on 15 August 1860 at Southwick, Hampden Co., MA. She was the daughter of Julius Hollister and Juliette Lay. Lizzie May Hollister married Asa Hiram Case, son of A. Hiram Case and Eunice Higley, on 25 October 1882 at Southwick, Hampden Co., MA. Lizzie May Hollister died on 7 December 1914 at age 54.